As many of you know, we sold our house in thirteen days. This was great, of course, because we didn’t have to deal with a lot of stress waiting for an offer. However, the fact that we sold so quick didn’t leave us much time to find a new home to buy. So, in the meantime, we have to rent. Fortunately, we have a friend who happens to have a vacant rental home about ten minutes from Greg’s new job. Sure, it isn’t ideal, but we’re thrilled that we didn’t have to move into an apartment. 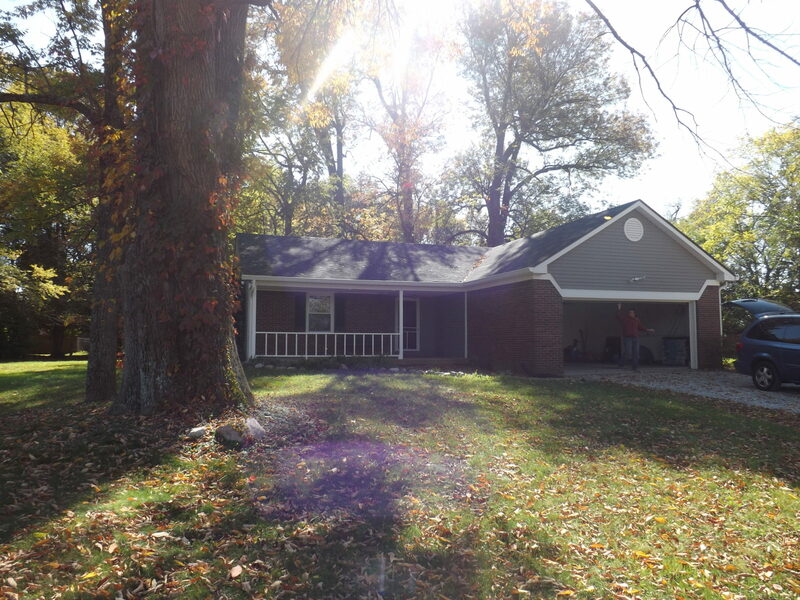 After all, we are leaving a 4 bedroom, 3 bath home that had almost 2,400 square feet! I simply cannot imagine moving into an apartment without a garage or place to put our lawnmower or the stuff from our attic! Our temporary home has 3 bedrooms and 2 bathrooms and sits on two acres. And, although it only has 1,168 square feet, it’s laid out rather well. 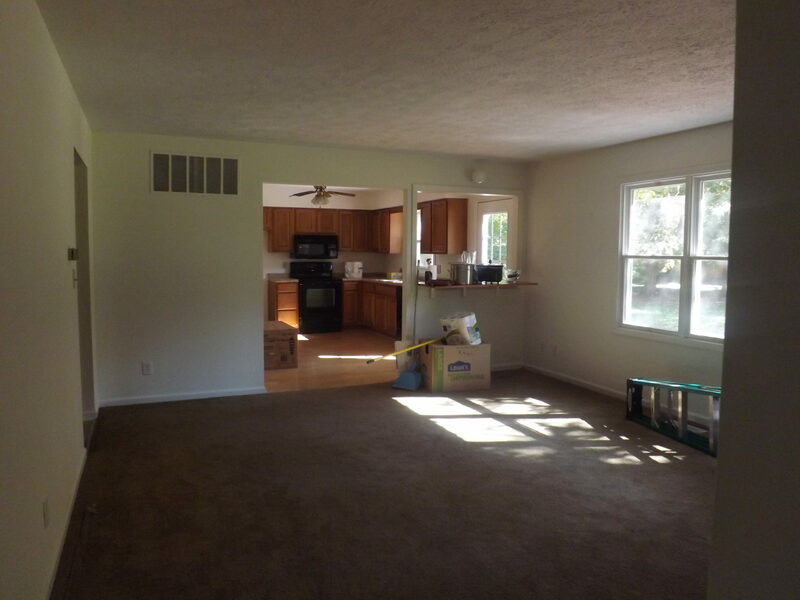 Basically, it has one large living room in the center of the house that the bedrooms and kitchen branch off from. It doesn’t have much storage above ground but it does have an empty, dry basement where we can keep some of our stuff. Although the house has been vacant for a while, it’s in pretty good shape. Last weekend, we stopped by Target to buy some supplies for a good deep clean. This upcoming Saturday I’m having the carpet professionally cleaned, which Greg thinks is crazy. But, my two-year-old literally licks the floor sometimes so I feel that it’s necessary. I don’t know who lived there before us or how clean or dirty they were. I also had a carpet cleaning coupon that made it only $89 for the whole house. Do you think it’s crazy to have carpets cleaned in a house you don’t own? Help me out here! The inside of the house is small but functional. However, the outside is absolutely gorgeous. 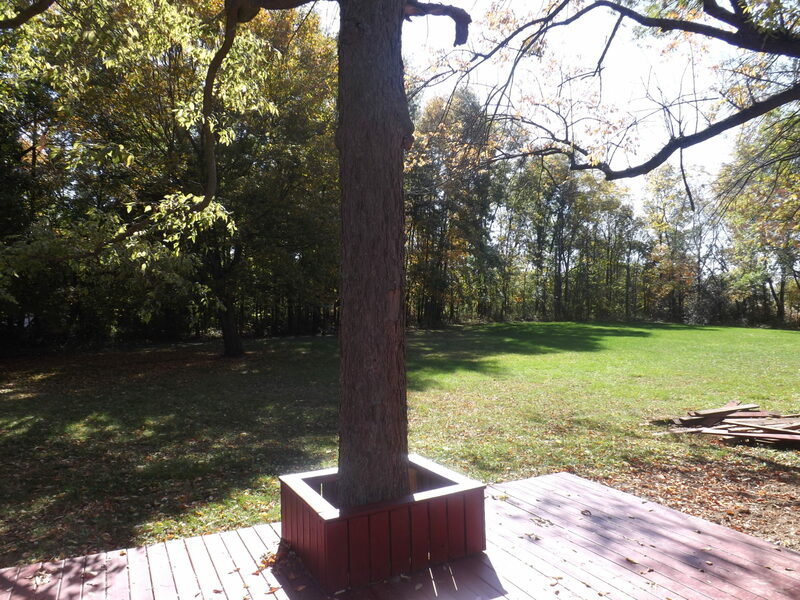 The back of the house has a large redwood deck, a firepit, and two acres of natural beauty. The yard has ginormous trees that create a beautiful canopy of shade all around the property. 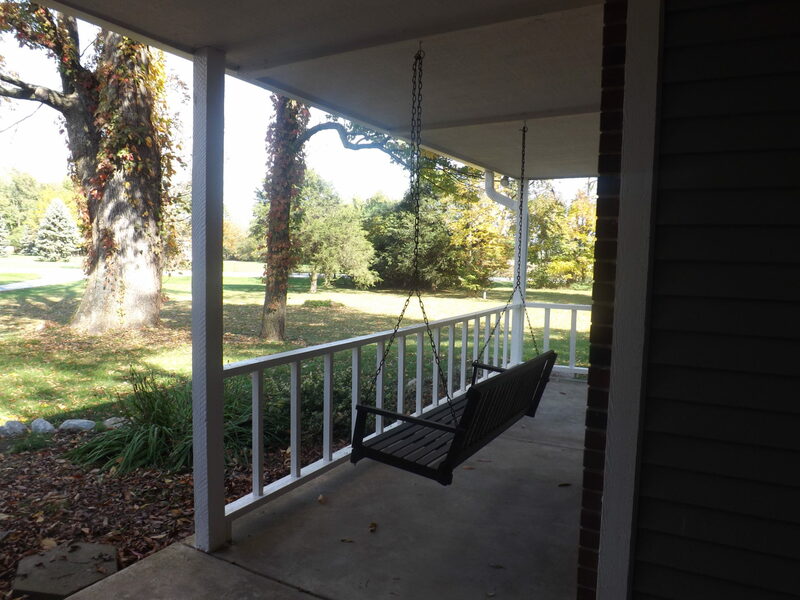 The front porch also has a porch swing which is something I’ve always wanted but never had. Overall, we’re thrilled that we’re able to rent this house for $700 per month. I honestly cannot believe how this deal fell in our lap but I’m happy it did. This experience will give us the opportunity to “try out” small home living and continue to save money for the down payment on our next home. What do you think about our small house experiment? What do you think about living in a small home? And, can you believe someone is renting us this house for $700 per month? A lot of rental contracts here stipulate the carpets must be professionally cleaned at the end of a tenancy. So yeah, I’ve done that a few times. According to internet calculators, your house works out to about 100 sq metres, which is a pretty normal (maybe even slightly large) house in NZ. I’ve never lived in a house that’s larger than that! I’ve heard that houses are smaller in NZ. In the US, houses have become much larger on average. That back yard is beautiful. That’s something I’d really love to have whenever we buy. I had a big back yard growing up and it was so much fun to be able to play out there. Sounds like you guys really have a great setup, and if the space is an issue you’ll be able to move soon. It’s a pretty ideal temporary solution. Love it Holly, I’m glad y’all are trying this out. Even if you’re not in love with the whole package I think it will give you some good perspective on what you really need/want in your next home. I’m a big fan of the smaller house idea, one of the things we did to help with storage was to grab a 10×10 shed kit at Lowes when we first moved in. It’s been critical, and only cost us around $900 for everything. A shed is an awesome idea for storage. You don’t have to heat it, cool it, or pay property taxes on it. Plus, you can paint it to match your house! I’m a DIY person, so while renting, I’d be looking the place over very closely to determine if you could buy and add on to the floor plan. From what I see, I like very much. 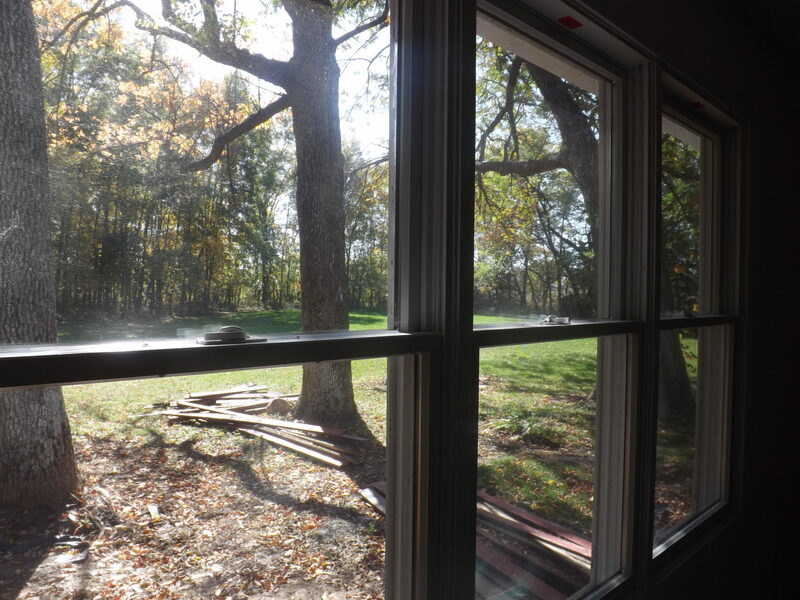 Love the 2 acres for the kids to grow up on…tree house and swings are possible too! Yes, they are. There’s a woods in the back where it looks like someone built a fort at one point as well. It’s really cute! That place looks great, especially the outside. The thing is, you don’t have to love the place, it just needs to function for the time being. And that price is really absurdly awesome for a full house (at least in my world!). As for cleaning the carpets: yes, do it! It doesn’t matter that you don’t own it… and less than $100 for that piece of mind. Totally worth it, I think! It is a big deal when you have kids! There is literally nowhere to sit when helping them take a bath except for on the toilet. And, there’s nowhere to stand to dry them off! A few extra feet in there would be really helpful. The glass door shower enclosure doesn’t help if you’re trying to bathe some kids. My old house had two 8×5 bathrooms, and they could have been a little bigger, but they worked. The house is beautiful! And no, I can’t believe the deal you got. Thankfully, the glass shower enclosure thingy is in the master bathroom. The other bathroom is just as small but does not have a shower door. I’m basically going to have to sit on the toilet while bathing the kids then drain the bathtub so I can dry them off. It’s going to be interesting! I really can’t believe the $700/month price tag. That’s only slightly more than we rent our basement studio for! I don’t have kids, but if I did I feel like I would be totally paranoid about things like whether the carpet is clean or not, especially if they lick the floor. Getting it professionally cleaned totally makes sense. Thanks for backing me up, DC! Greg said that the carpet looks clean already….but it’s dark. You can’t tell what it’s hiding. Oh my gosh, Holly, what a gorgeous place!! I’d live there in a minute! We moved to a house half the size of our original house too, and although it’s definitely an adjustment (especially the small bathroom thing), we’re very content here. I think the large lot and the country views will make it worth it too. Can’t wait to hear if you like it or not! Wow, $700/mo for two acres of land? That’s a steal in my book and the backyard looks awesome and the house doesn’t look too shabby either. I am totally with you on the carpet cleaning, especially at that price. Our little ones are constantly doing something on it, licking it too, so it’s worth the cost in my opinion. It will just make me feel better about it. I think peace of mind is worth $89 sometimes! For me the best part of any move is the motivation to toss out the junk. Boxing your life possessions forces you to decide if hauling everything to a new location is worth the effort. As the boxing and un-boxing proceeds the value of the old junk diminishes. Moving to a smaller house with less storage makes you purge even more. And knowing that little ones can crawl on a clean carpet is priceless! I agree! Fortunately, we don’t have a lot of stuff. I had a garage sale this summer and gave all the leftovers to Goodwill. Most of the stuff we have is stuff we’re going to keep and I’m so glad there’s not a lot of it. I have thrown some random things away though that I’ve found. Moving really is a great time to reevaluate all that you have. I really like that house and the views are simply amazing! You really got a great deal at $700 per month and even though the space is smaller than what you’re used with, it surely is enough for a transition phase. Regarding the carpet – I would always put the health and well being of my kids above everything, so I do believe that it’s the best thing to do. Me too! Wow, I’m getting a lot of support on the carpet cleaning! What a fantastic deal. Your son and I have a ton in common….carpet licking is pretty damned fun. Thanks for your support! Carpet lickers unite! Love the house. I’d almost like to see how well we could do in a smaller house. I’m curious to see how it works and if you get to the point where you need a shed for the kids. Yes, I would have cleaned the carpet as well. Wow, that bathroom is tight, and not up to code, but who cares? How much time do you spend in there anyway? As you mentioned, the most important aspect is the layout. Make the common areas where you spend your time large and useful. Minimize bedrooms and bathrooms. Also, forget the living room. Just give me a large family room and I”m happy. In our new home, we aren’t any less happy. Sure it is smaller and we have to get rid of stuff, but the lack of cathedral ceilings and a slightly smaller kitchen don’t bother us. Also, most of us could use less stuff. We’ve been house shopping and actually looked at a few houses over 4000 square feet at the beginning. (That was when we were looking based on bedrooms/bathrooms and not size). They were kinda ridiculous, I thought. One of the houses had a master bedroom that was 23 by 20. I just wondered what in the world we would do in there. It was like its whole mini-apartment. Oh, I love it!!! I could live in a tiny home. Our townhome is 1,400 sq ft and too big for the two of us. 1400 s.f. doesn’t sound so bad for 2 people! That’s about the size of the house my ex-husband and I had. It worked just fine for us but then again we weren’t used to living in a house twice the size. I have kids the same age as your kids – get the carpet cleaned. My kids would be rolling around on the floor, crawling on it, and yes – occasionally licking it (well the youngest anyway) I would feel better if it were professionally cleaned. Yes, it certainly won’t hurt! And how awesome is that porch swing??? So cool! Yep! That’s how I feel. I don’t like dirty carpet. Congrats on selling your house, and I think this small home experiment is a great idea! I’ve been doing small space living for the past 16 months, and I’m loving the cost savings associated with it. Also, I’d DEFINITELY get those carpets professionally cleaned – you don’t know who lived there previously! Yes, exactly. They look really clean but they’re dark so you never know! I get my carpet professionally cleaned about once a year. You drag so much stuff in from outside and I have a cat so it’s a good idea, especially if you have kids. That seems like a great price for a whole house (regarding the carpet cleaning), and of course the rent too. It looks like such a peaceful place. I would definitely get the carpets cleaned too, especially since you have kids. Kids will at least roll all over that carpet and eeek – lick it too. 🙂 The yard looks gorgeous and so spacious. In LA, unless you are mega-rich, your’ backyard is tiny. I can’t imagine having all that space! It looks like a great rental at a great price. It will be interesting to see how you feel about living in a smaller house. The yard really is nice. I don’t know if I would want to take care of all of it permanently though! Such a cute house. I always wanted a swing on my porch. Other people’s carpets are gross and there is always that mystery yuck factor. As a renter you are correct to have the carpets professionally cleaned and if you buy you need to have them replaced. That’s a beautiful property, and about the same size as our home. There’s a part of me rooting for the small house appeal and hoping you guys will throw some smaller properties into the search. What am amazing back yard! For $700/month that appears to be a steal of a deal! I read your original post at GRS so was happy to find the pictures here. I hope you enjoy your small house! I live in a small home. It’s a ranch style, 900 sq.ft. on the main level and 900 sq.ft in the basement. I always wanted a small home because of the lower maintenance costs. Your rental looks very cute. I especially like the swing on the porch and the quiet surroundings. Carpet cleaning is a must especially with the little ones. The rental price is excellent. I love the outside of this house, it’s simply beautiful! I don’t have a problem living in a small flat/house. A lot of flats and houses in London are really small as real estate is so expensive (the average cost is £13k for 1sqm, crazy!). I guess it’s different when you have children as you want them to have a garden to play in, etc. We definitely need a yard for the kids to play in. It doesn’t have to be huge though. 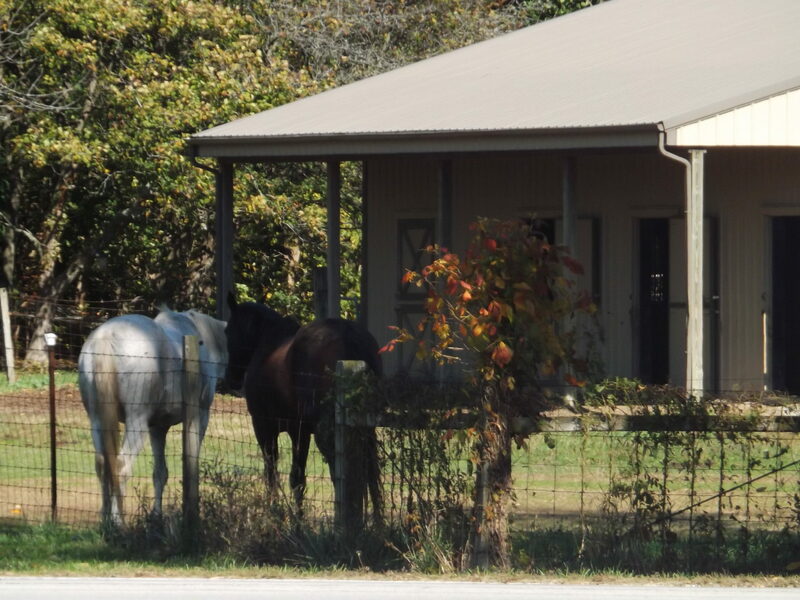 The house we’re selling is on .33 of an acre and the yard was plenty big. First off, $89 for carpet cleaning is WAY worth it. For all you know the previous tenants had pygmy goats living in one of the bedrooms. Although I’m guessing the smell would be a giveaway. Second, I’ll bet you guys will like loving in a smaller home. Cheaper to heat when the weather gets cold, less house to clean, and overall cozier and homier. Not sure if “homier” is a word but I’m sticking with it. I’ll be curious to see how it goes. Me too. I think it will probably be too small for us at 1200 s.f. But, I think we could live with a lot less than the 2400 s.f. we’ve had. I think we need to find something in the middle. I am very jealous of the price. The house seems really cute, and the outside is gorgeous. Trees and leaves all around! That bathroom looks about the size of the one in our old house. I would love a double sink with a big vanity at some point, but it wasn’t too bad to deal with. I don’t think you’re crazy for getting the carpets cleaned if your little one has a tendency to lick it – I would be a little worried, too. I have always wanted a double sink….maybe in our next house! Hey, that’s a good idea. If I had more time, I would probably try to clean it myself. We’re on a time crunch though! Our first house was 1050 sq ft, second house was 1500 and current house is 2500. I liked the 1500 sq ft house because it had a finished basement! I really love the house you’re renting – our property taxes alone are $400! I’m sure he could rent it for a lot more than $700 if he wanted to. We looked at apartments at first and most of the 3 bedroom apartments were at least $1100 per month! Oh my gosh, what a deal! For $700 a month, you might be able to get a TINY studio in Harlem. That yard looks stunning and I love the porch swing. Apartment living has really helped me realize I don’t need a lot of STUFF. Purging and being minimalistic is liberating! It really is liberating. Even though we have a 2400 s.f. house, we’ve moved very few boxes so far. Most of our “stuff” is just furniture from all of the rooms. It’s been nice to not have to pack a ton of crap. Looks pretty nice! You could take your down payment and buy a home and rent it out. Ha! Maybe. I think we’re done with rentals for the time being though…at least while our kids are little. The two rentals we have keep us plenty busy. It sounds to me like you really like this house. It is beautiful. Maybe you two should consider seeing if Greg’s friend is interested in selling. You could always use some of the proceeds from your house to add an addition if you think you need more room. I’m not sure we want to live in the country. We really enjoy taking the kids for a walk in the neighborhood almost every night. Plus, I work at home and I think I would feel really isolated if we didn’t live near others. But, I definitely wouldn’t rule it out. You never know! What a lovely home. It’s only temporary so I wouldn’t sweat the small bathrooms. We adapt to what is handed to us. You’ll make it work. Good luck on your dream home pursuit! It looks like a great deal! With that much outdoor space, the indoor space shouldn’t seem too bad. You could get a pretty nice backyard setup going during the warmer months. A year ago I think it would’ve been awful since we got ready at the same time in the morning. Now that I usually shower after he leaves for work, it’s no big deal. The kid’s bath time might be interesting though. I basically have to sit on the pot to bathe them and there’s really nowhere to dry them off. I think we’ll survive though. In a house that small, it really doesn’t make sense to have big bathrooms anyways. That looks like a great deal, the outdoor space is amazing! And no, I don’t think you’re crazy for having the carpets cleaned – I would do the same! put me in the “carpet cleaning isn’t worth it” camp, but that is just because of a few bad experiences. the carpet would stand a little higher and smell like shampoo for a couple of days, and then would look exactly the same as it did before. to your greater point.. i think we could live in a smaller house if need be. sometimes its a good idea to mix things up and experience life in a new place for a little while.. I love small houses! We live in a small home and have too much space and too much stuff! That house is so so cute. That is a really beautiful house! The property looks amazing. Small houses are nice because there is less to clean 🙂 Although, if not laid out well, that’s a big issue. You are very fortunate that this all worked out so well for you! I think it’s SMART to have carpets cleaned! Carpet can be disgusting and if you didn’t live in it, GOD knows what’s living in it. I also need to get our basement professionally cleaned asap but keep putting it off knowing the work involved with moving all the furniture. For six whole years our house was just the right size if not a little too big. Now it is just too much house for the two of us. We will have to live here for a while because values in this area have not recovered and we moved right as the bubble burst. We are on four acres and I grow almost all our produce. Our pear trees are still full and next year is the first year we will get to harvest asparagus….so I’d rather have the land than the house. It’s great that you don’t have to rush into a buying decision and living in a smaller home may actually help you keep from making the mistake we made. 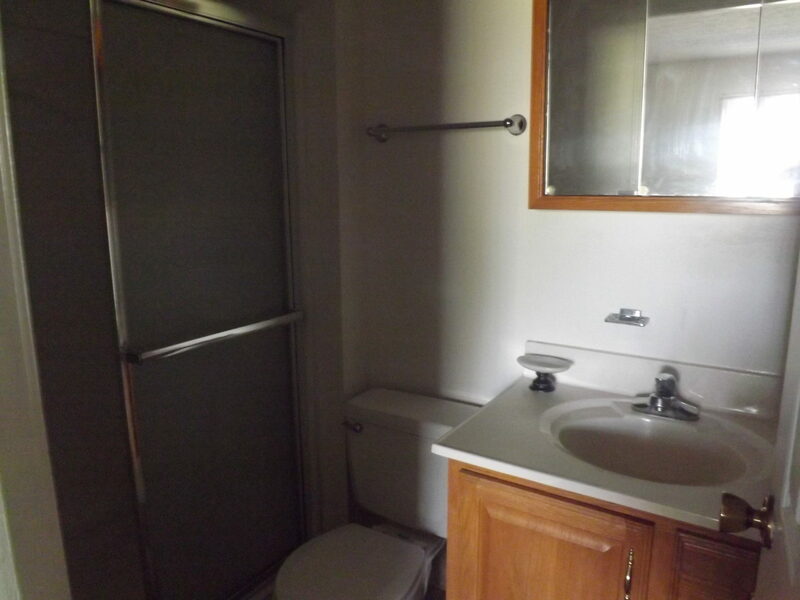 Whoa, that shower door is incredibly close to the toilet! Other than that, the property looks beautiful! If I could rent an entire house for $700, I’d pee my pants with excitement. I pay half that now for my rent and that’s on the cheap side for my area! With money savings like that, I’m sure you all can save up for an entire house in no time. Small living is the way to go. Hope it goes well!